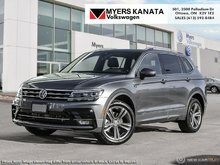 Among crossover SUVs, this 2019 Volkswagen Tiguan stands out for its spacious and elegant interior. AS one of the most minimalist styled crossover SUV's, the Tiguan is still as elegant as a VW would be. 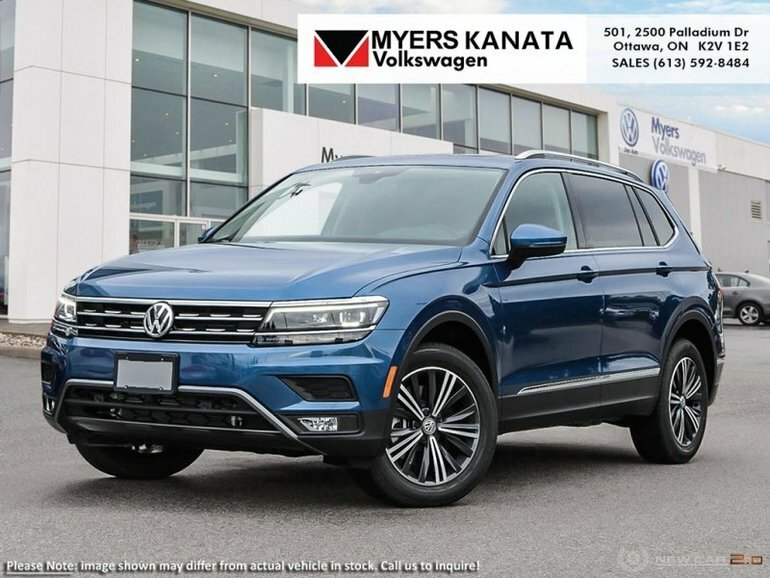 Crisp lines, a luxurious ride quality and the largest interior within its class give this Tiguan the high marks as the leader of the crossover SUV segment. This silk blue met SUV has an automatic transmission and is powered by a 184HP 2.0L 4 Cylinder Engine. Our Tiguan's trim level is Highline 4MOTION. This top of the range Volkswagen Tiguan Highline comes very well equipped making every drive an absolute pleasure. Options include dual power sunroofs, rain detecting wipers with heated jets, a power tailgate, front fog lamps, cornering lights, fully automatic LED headlights, a Fender premium audio system with 8 speakers and a sub-woofer, dual front LCD monitors, App-Connect smartphone integration, Bluetooth connectivity, front sport comfort seats with power adjustment, a heated leather and piano black surfaced steering wheel, proximity keyless entry and push button start, remote proximity cargo release, dual zone front automatic air conditioning, remote engine start, Nappa leather seat trim, park distance control front and rear parking sensors, blind spot detection sensor, front collision prevention assist with autonomous braking, a rear view camera and much more. This vehicle has been upgraded with the following features: Driver Assistance Package. 184HP 2.0L 4 Cylinder Engine - 4 cyl. 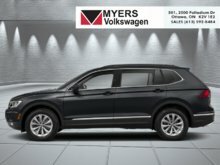 Ce véhicule, Volkswagen Tiguan Highline 4MOTION 2019 vous intéresse? ** Le prix indiqué inclut tous les frais. Les taxes et la license en sus. 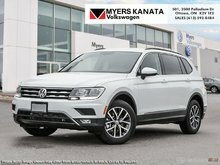 Je veux recevoir des courriels de rappels, nouvelles et promotions de Myers Volkswagen.